One of the most audacious acts of shameless, straight-faced opportunism ever to have been imagined in the world of communications. I’ve chosen a Crivelli painting from 1486 as the image source of my headers because it is such a cheeky picture and always amuses me. The Archangel Gabriel kneels in the middle of a street with townsfolk going about their business around him, all failing to spot the miracle in their midst. Even two business-like monks on a balcony don’t see what is happening literally under their noses. This Gabriel is virile, an angelic prince. His clothes are still rustling in the breeze of his arrival and his gaze is inward as he prepares to announce the offer of a pregnancy. He is about to lift his eyes to the Virgin; she is still absorbed in her book. It is the moment before the moment when everything will change, charged with possibilities. This painting was commissioned by friars in the small city of Ascoli Picena in the Italian Marches to celebrate the granting to the city of Libertas Ecclesiastica, self-government free from papal rule. The good news had been received on the 25th March, feast of the Annunciation, 1482, so the brief required a Virgin Mary and an Archangel Gabriel but the commissioners demanded an extraordinary addition, the inclusion of their city and their patron saint, Bishop Emidius. Crivelli shows Emidius between the angel and Mary, proffering a model of the town. He is muscling in on what Crivelli’s contemporaries would have regarded as the greatest act of communication in human history with, Gabriel, while you’re here, could you just spare a blessing for my pals before moving on to the big business? Won’t take a minute. The bishop knows what he wants and he picks that precise moment before Gabriel and Mary connect with other. A second later would be too late. Their eyes would lock and he would be locked out. I love the fact that this epoch-making act of communication is happening in a street of the 1480s amidst business of various kinds: a father and son with two tough monks; a girl being eyed up by two young men as she passes with her chaperone; a working-woman carrying a load; a poor man cap in hand to a businessman reading a letter; the pigeon-post and the divine dove. This is a painting about communication yet no one is looking at precisely the right spot. The child comes closest to pinpointing the main action. The man shading his eyes at unusual brightness above him fails to see that heaven really has opened. Only Emidius – and the citizens of Ascoli Picena – take advantage of the opportunity. Journalists are supposed to see what’s going on in the everyday world around them. They’re supposed to read the signs of the times and share them. We expect them to be where the action is and to care about ‘the city’ – the civic sphere; to be thoroughly and perfectly secular. But since the journalist’s work demands not only the prosaic, they have something in common with every professional in the communications world: they have to ignite imaginations because otherwise there is no empathy to drive action about what they report. The aim of poetry and the poet is finally to be of service, to ply the effort of the individual into the larger work of the community as a whole. I wonder how Crivelli reacted when his commissioning brief for an Annunciation included a demand for the inclusion of that bishop. Any documentary-maker knows the challenge of reconciling seemingly incompatible commissioning elements, particularly of the ‘and-while-you’re-at-it’ type. 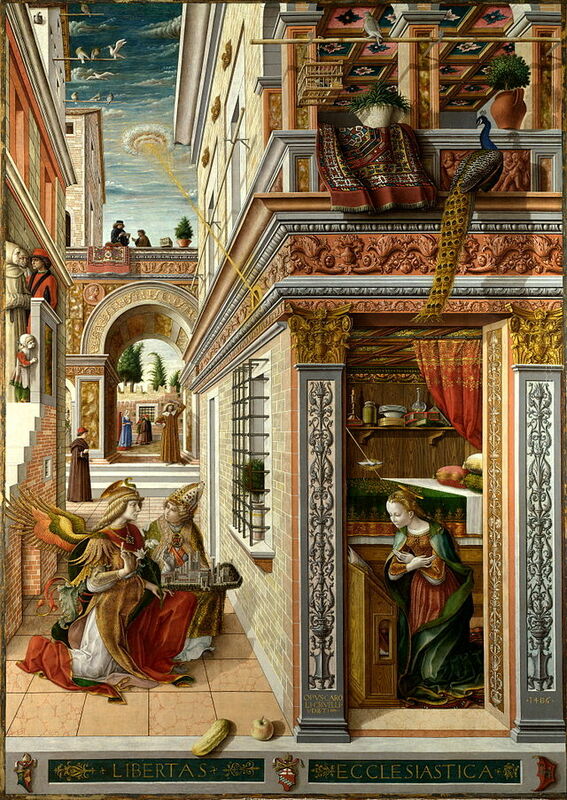 Crivelli managed to serve the community while giving his personal imagination free rein within the constraints of the brief – which he nonetheless exceeded brilliantly (partly by a near-superfluity of allegory – that madly outsized apple and gourd in the foreground, for instance). That bishop’s baby-face (he had been notably young) belies his possession of qualities found in good journalists: the audacity, confidence, preparedness (3D model of the city in question, guv’nor? no probs) and the knack of being in the right place at the right time. I wish I had his nerve! Perhaps he should be the patron saint of PR people because this painting was the best promotional investment Ascoli Picena ever made. It has been paying off for centuries.